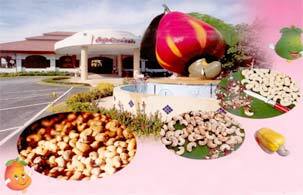 The Srisupphaluck Orchid Co., Ltd., an over-50-year trader of the cashew nut, realizes well the medicinal properties of this kind of fruit. In 2001, the company, in cooperation with the Department of Industrial Promotion, started researching on the cashew apple juice. The project was under the charge of the faculty members of Prince of Songkla University. Cashew Nut is well known as Phuket local food with distinguishable shape as same as its seed appears at the outside. Cashew Nut is the most unique fruit in the world. Additionally a temperature in Phuket which makes Phuket Cashew Nut become a delicious fruit, crispy, little sweet more than another places in the world. The juice contained in the cashew apple has several important medical properties, believing that it can cure chronic constipation and relieve pains and aches caused by neurasthenia and arthritis. Cashew apple juice also serves to stimulate the brain and strengthen your memory. Srisupphaluck Orchid Co., Ltd. opens 7.30 a.m. - 6.00 p.m. daily, agencies can pre-booking for visiting and tasting Cashewy Nut or Cashewy Juice.